To request for more information and quotation, please click here. As a MOM approved Accredited Training Provider (ATP) and BizSAFE Service Provider, we conduct wide range of training for Managers , Supervisors and Workers. To cater your every needs. we are continuously introducing new training courses and in various languages as well. In-house customised training on specific workplace safety and health topics for clients is also available upon request. - The possible legal liabilities will be advised with regards to the accident. - Organisation will be advised on implementation of FPP with the various strategies. - Gap analysis of the organisation’s safety management system with an action plan. - Organisation will be advised on the implementation of the action plan. - Review of the investigation findings, relevant documents, etc. - The probable legal liabilities will be presented. - Review of the case and provide views with regards to the cause of the accident. - A report will be furnished for submission to the relevant authorities and the court. e)	Whether consultancy relating to the management system to be audited has been provided and if so, by whom. f)	Copy of previous audit report if the audit was not conducted by AKC. c)	The site(s) of the applicant organization’s operations, time required to complete audits and any other points influencing the auditing activity are taken into account (language, safety conditions, threats to impartiality, etc.). After reviewing the application, AKC will inform the applicant organization’s authorized representative formally through email, whether the application has been accepted or declined. Where the application is declined, the reasons for declining the application shall be documented and made clear to the client. If the application is accepted, AKC will determine the number of auditors for the audit, the competences needed to be included in the audit team and the audit duration (based on Annex 2 to Appendix 1 and Annex 2 to Appendix 2 of CT 17). 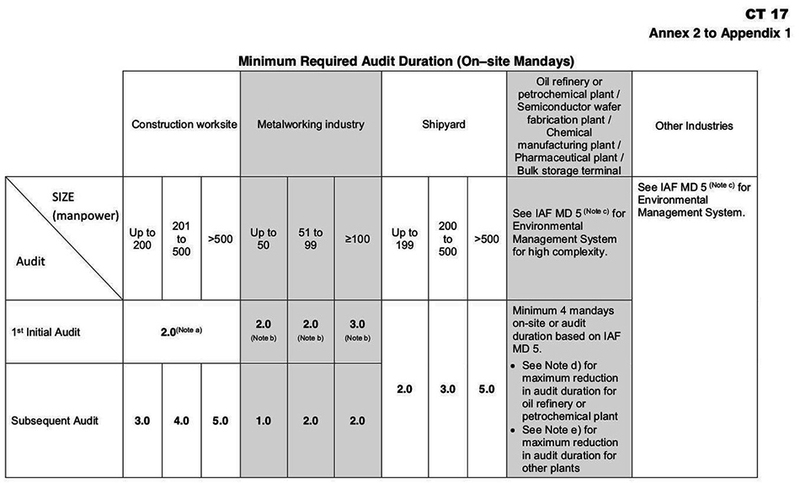 The minimum time for conducting an audit will be determined in compliance to the requirements stipulated in Annex 2 to Appendix 1 and Annex 2 to Appendix 2 of CT 17. Additionally, the Lead Auditor will consider the time needed to plan and accomplish a complete and effective audit of the client's management system. The Lead Auditor appointed by AKC will discuss with the client to determine the audit objectives and establish the audit scope and criteria. An audit plan is established for each audit to provide the basis for agreement regarding the conduct and scheduling of the audit activities. The audit plan will be communicated, and the dates of the audit agreed upon, in advance, with the client. •	Review of documentation and records. 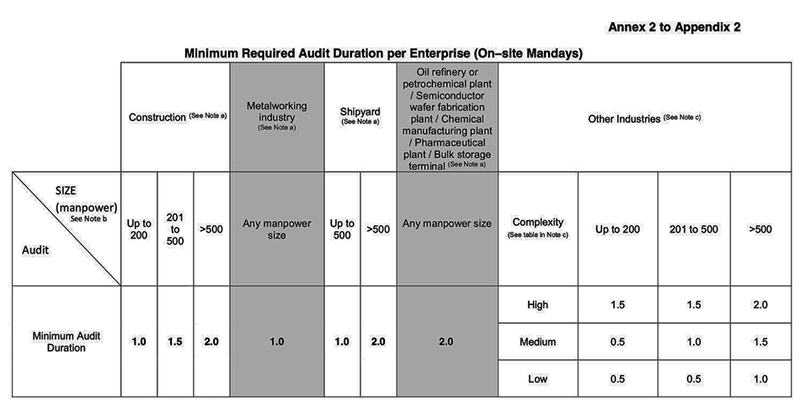 A written report will be provided to the client for each audit conducted. If the SAC mark is included on the first page of the audit report, AKC’s logo shall be located preferably next to the SAC mark with reference to SAC 02 - Rules for Use of SAC Accreditation Marks and Mutual Recognition Arrangement (MRA) Marks. An acknowledgement of receipt of the request, complaint or feedback will be sent to the sender. Additional information requested may be approval at the discretion of AKC. For complaint received, AKC will evaluate the complaint and take necessary action(s) to address the complaint. AKC will feedback to the complainant on the action(s) taken. The management of AKC is committed to ensuring impartiality in all auditing activities undertaken by its auditors and shall not allow commercial, financial and other pressures to compromise impartiality. AKC’s name and mark or logo shall not be used in communication media such as the Internet, brochures or advertising, or other documents without the written consent of AKC.